↑ 1.0 1.1 Gray, Henry. Anatomy of the Human Body. Philadelphia: Lea & Febiger, 1918; Bartleby.com, 2000. Chapter X.1d. 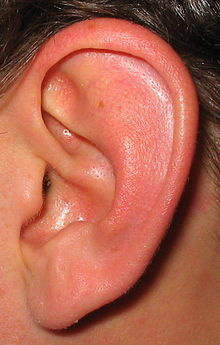 The Organ of Hearing. Available at . ↑ Asano F, Suzuki Y, Sone T (1990) Role of spectral cues in median plane localization. The Journal of the Acoustical Society of America 88:159–168. ↑ Standring, Susan (2008). Borley, Neil R., ed. Gray's Anatomy: The Anatomical Basis of Clinical Practice (40 ed.). Edinburgh: Churchill Livingstone/Elsevier. pp. Chapter 37. "Inner ear", 633–650. ISBN 978-0-443-06684-9. ↑ "Tinnitus". March 6, 2017. Retrieved 27 July 2018. ↑ 9.0 9.1 9.2 Tucker AS (2017) Major evolutionary transitions and innovations: the tympanic middle ear. Phil Trans R Soc B 372:20150483. ↑ Mills R (1994) Applied comparative anatomy of the avian middle ear. J R Soc Med 87:155–156. 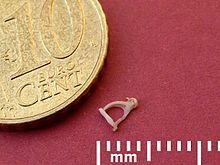 ↑ 11.0 11.1 Khorevin VI (2008) The lagena (the third otolith endorgan in vertebrates). Neurophysiology 40:142–159.